Meet NCVPS Super Student Hassan A. 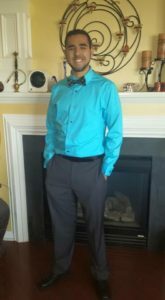 North Carolina Virtual Public School > News > Super Students > Meet NCVPS Super Student Hassan A. The NCVPS Super Student Award is for students who have gone above and beyond the course requirements and as a result have enriched the content, class dynamic, their own learning, their classmates’ learning, and even their teacher’s learning. NCVPS Super Student Hassan A. “My future plans include college. I will be attending Appalachian State University in the fall, and I hope to attend either Duke or Chapel Hill’s medical school. I aspire to become a pediatric endocrinologist, which is a children’s doctor that specializes in children with hormonal disorders, such as Type 1 Diabetes. Since I am a Type 1 Diabetic myself, who could truly empathize with a patient better than a doctor who is managing the same illness they are?” –Hassan A. This online course allowed me the opportunity to learn another language that my school did not offer in a typical class setting. Taking an online course definitely granted me flexibility, which became extremely beneficial in time managing, considering I took AP classes. Taking an online course is very easy and extremely flexible with any schedule. The assignments were easy to accomplish, but I truly learned a lot by completing them, enforcing the knowledge I obtained during that lesson and/or module. Take an online course because you are truly interested in the course and not for the easy grade. It will make the experience even more enriching. I spend most of my time on YouTube and Netflix. I love Youtube because there is a video about literally ANYTHING, and I like to watch react videos, gamers, and other well-known youtube sensation. Since I hardly ever watch TV, Netflix serves as a great alternative. I love my laptop because it grants me access to Youtube and Netflix. I also enjoy my Xbox One and 3DS because I love playing video games! Honestly, my goal was just to pass my classes with an A or B and finally graduate High School. Another goal I had this semester was to finish AP Chemistry with at least a C, since this is by far one of the most rigorous and challenging classes at my school. I am fluent in English and Spanish, and I have a decent knowledge of French, and now two levels worth of Arabic. I don’t have a favorite book, however, I do have a favorite book series, and that is the Rick Riordan Heroes of Olympus series. I am truly FASCINATED by Greek and Roman mythologies, especially the way they are integrated into the book’s plot. At the moment (because I change favorite songs often) is Immortals by Fall Out Boy. At the moment my two favorite shows are Empire and Dancing with the Stars. I am half Hispanic and half Arab. My mother is from Ecuador in South America and my father is from Lebanon in the Middle East. I am the oldest out of three. I have a younger brother and a younger sister.